The present application related to a rotating arm type permanent magnet motor, in particular to a permanent magnet motor that was actuated by the action of the magnetic forces of a permanent magnet stator of a stator module and two thin ring permanent magnets of a rotor module. The purpose of present permanent magnet motor was to provide the torque produced by a magnetic force of the magnetic energy of a stator to drive the rotation of the rotor. The rotating arm type permanent magnet motor comprised an external support frame base, a stator module and a rotor module. The external support frame base included an upper frame, a lower frame and two side frames. The stator module included an elastic metal plate cantilever arm and a permanent magnet stator. The rotor module included a rotating shaft, a double arc shaped rotating arms type support frame, and two thin ring permanent magnets. Magnet material N45H (sintered Nd–Fe–B) was used for the permanent magnets of stator and rotor. The values of magnetic forces (attraction force and exclusion force) were inverse proportional to the position distances of poles (N pole and S pole) above the top level of thin ring permanent magnets, e.g. c= 12mm. The greater value of magnetic forces got the faster rotation speed. The values of magnetic forces could produce the good enough torque for the thin ring permanent magnets to rotate the shaft when position b= 8mm better than that when position b= 17mm. In the future, with the help of using an external swing motion of electrical controlled swing-type device to produce complete rotation, the present permanent magnet motor might save electricity and power sources. Some preliminary rotation speed data of rotating shaft in a permanent magnet motor were obtained and presented with manually controlled. lectric motors,” https://www.explainthatstuff.com/electricmotors.html, April 4, 2018. X. Liu, H. Yu, Z. Shi, T. Xia and M. Hu, “Electromagnetic-fluid-thermal field calculation and analysis of a permanent magnet linear motor, ” Applied Thermal Engineering, vol. 129, pp. 802-811, 2018. I. Boie, C. Kost, S. Bohn, M. Agsten, P. Bretschneider, O. Snigovyi, M. Pudlik, M. Ragwitz, T. Schlegl and D. Westermann, “Opportunities and challenges of high renewable energy deployment and electricity exchange for North Africa and Europe Scenarios for power sector and transmission infrastructure in 2030 and 2050,” Renewable Energy, vol. 87, pp. 130–144, 2016. L. Sun and N. Zhang, “Design, implementation and characterization of a novel bi-directional energy conversion system on DC motor drive using super-capacitors,” Applied Energy, vol. 153, pp. 101–111, 2015. F. H. Ramírez-Leyva, E. Peralta-Sánchez, J. J. Vásquez-Sanjuan and F. Trujillo-Romero, “Passivity-based speed control for permanent magnet motors,” Procedia Technology, vol. 7, pp. 215–222, 2013. M. Demirtas and A. D. Karaoglan, “Optimization of PI parameters for DSP-based permanent magnet brushless motor drive using response surface methodology,” Energy Conversion and Management, vol. 56, pp. 104–111, 2012. A. Hassanpour Isfahani and S. Vaez-Zadeh, “Line start permanent magnet synchronous motors: Challenges and opportunities,” Energy, vol. 34, pp. 1755–1763, 2009. J. Ganssle, S. Ball, A. S. Berger, K. E. Curtis, L. A. R. W. Edwards, R. Gentile, M. Gomez, J. M. Holland, D. J. Katz, C. Keydel, J. LaBrosse, O. Meding, R. Oshana and P. Wilson, Embedded systems: world class designs. UK: Elsevier, 2008. B. Bolund, H. Bernhoff and M. Leijon, “Flywheel energy and power storage systems,” Renewable and Sustainable Energy Reviews, vol. 11, pp. 235–258, 2007. Y. Matsuura, “Recent development of Nd–Fe–B sintered magnets and their applications,” Journal of Magnetism and Magnetic Materials, vol. 303, pp. 344–347, 2006. I. J. C. Compter, “Electro-dynamic planar motor,” Precision Engineering, vol.28, no. 2, pp. 171–180, 2004. J. M. D. Coey, “Permanent magnet applications,” Journal of Magnetism and Magnetic Materials, vol. 248, pp. 441–456, 2002. D. Chowdhury, “Stochastic mechano-chemical kinetics of molecular motors: A multidisciplinary enterprise from a physicist’s perspective,” Physics Reports, vol. 529, pp. 1–197, 2013. C. C. Hong, Rotating arms type permanent magnet motor. United States Patent Application Publication HONG, US 20160094095A1, Mar. 2016. C. C. Hong, “Application of a bending type segment permanent magnet actuator,” Materials Science: An Indian Journal, vol. 11, no. 9, pp. 311–315, 2014. C. C. Hong, “Application of a magnetostrictive actuator,” Materials & Design, vol. 46, pp. 617–621, 2013. C. C. Hong, “Transient response of magnetostrictive functionally graded material square plates under rapid heating,” Journal of Mechanics, vol. 29, no. 1, pp. 135–142, 2013. C. C. Hong, “Rapid heating induced vibration of magnetostrictive functionally graded material plates,” ASME, Journal of Vibration and Acoustics, vol. 134, 021019, pp. 1–11, 2012. P. Liu, R.L. Browning, H.J. Sue, J. Li and S. Jones, “Quantitative scratch visibility assessment of polymers based on Erichsen and ASTM/ISO scratch testing methodologies,” Polymer Test, vol. 30, pp. 633–640, 2011. 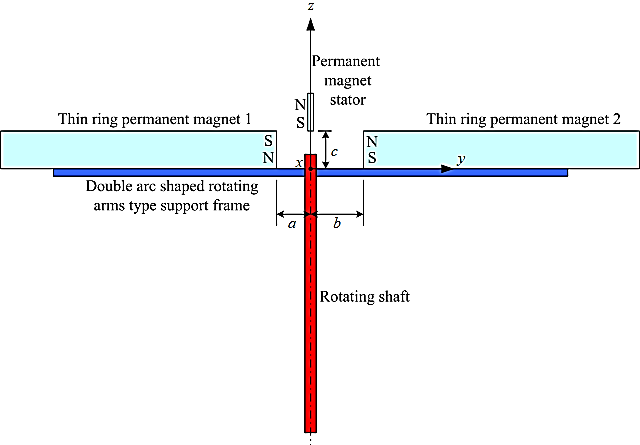 C.-C. Hong and D.-M. Tsai, “Application of Rotating Arms Type Permanent Magnet Motor”, AITI, vol. 4, no. 1, pp. 37-43, Jan. 2019.